After publication of our recent article , we noticed that Figure 2A was incorrect as a result of mislabeling of the image files. The correct Figure 2 is given in full here as Figure 1. Immunostaining for α-SMA in cutaneous samples. Representative tissue sample from: (A) Sham animal; (B) HOCl mice; (C) HOCl + PTU animal (original magnification, ×40). The arrows show strong diffuse staining of myofibroblast nuclei (dark brown staining). (D) Number of myofibroblasts from the three experimental groups (HOCl + PTU group, n = 10; HOCl group, n = 10; Sham, n = 5). 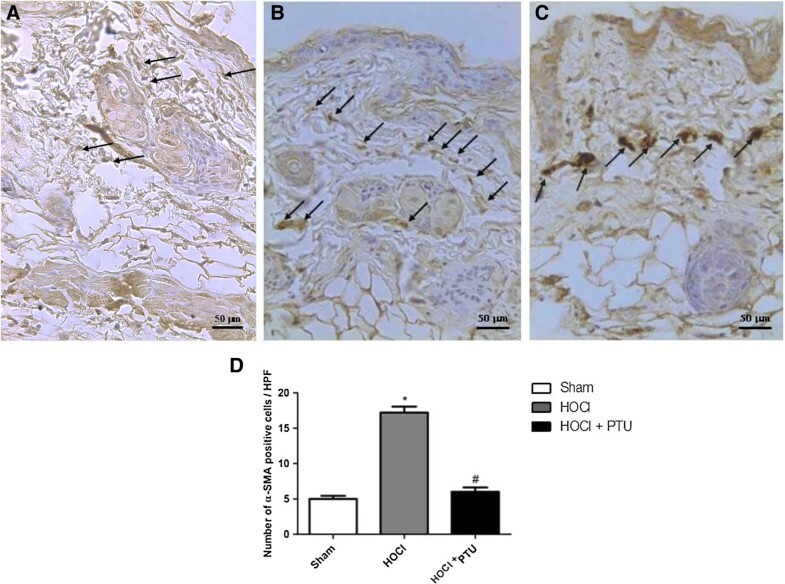 The increase of myofibroblast population in the skin of HOCl mice is prevented by propylthiouracil administration. Values are expressed as the mean and standard deviation. *P <0.001 versus Sham; #P <0.001 versus HOCl. α-SMA, alpha-smooth muscle actin; HOCl, hypochlorous acid; HPF, high-powered field; PTU, propylthiouracil. Gianluca Bagnato, Alessandra Bitto contributed equally to this work.